In just two days time, the little girl who was known as Beti B will turn one. Aaradhya Bachchan, daughter of Abhishek and Aishwarya, recently made her media debut when the latter was awarded at an event on her birthday. Aishwarya has said that her 1st birthday will be a private affair. 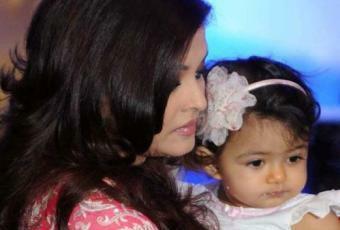 According to NDTV, Aishwarya spoke at a Children’s Day event and said, “Time just flies and now she (Aaradhya) will turn one year old. For Aaradhya’s first Diwali, we had both friends and family at our place but for her first birthday, we plan to keep it a private and family affair. It will be with family and my parents”. Abhishek was also present at the same event and he also commented, “First birthdays are generally special for the babies’ mothers as they spend so much time with them and take care of them”. Previous articleRanveer-Sonakshi to star in ‘Ishaqzaade 2’?